In a survey of kids aged 8 to 17, more male gamers would rather play videogames with Barack Obama than any other public figure. Gamecrazy presented a survey of over one thousand gamers between 8 and 17 years of age asking against whom they would rather play videogames. The research was conducted by Weekly Reader Research over a two-week period in August of this year, but it was not disclosed whether the survey was multiple choice or if the respondents generated their own answers. 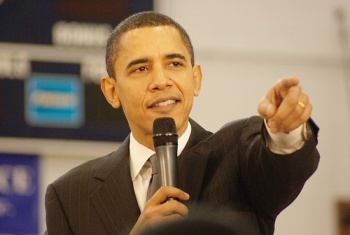 President Obama was the leading public figure chosen amongst all gamers with 19% of the total vote. The numbers are much different, however, for males and females in that age range, further proving that girls mature faster than guys. Or do they? After our current president, who garnered 25% of the male votes, was Tom Brady, the New England Patriots quarterback with 14%. Then there was a three way tie at 12% with the Jonas brothers (who it seems can only game as a group,) Seth Rogen and Michael Phelps. Apparently after the wholesome choices of politicians and athletes, male teenagers really just want to play games with a couple of stoners. As for the females, Miley Cyrus (It's Miley!) drew 23% of the girls wishing they could play games with the country TV star, but the Jonas brothers also scored 23% of the prized tween female demographic. Poor Obama was third amongst young ladies with only 13%, and he was followed by Lady Gaga (9%) and Angelina Jolie (7%). I'm not sure what it means that girls want to play games with the performer of Disco Stick and the baby-hoarder Jolie, but at least Obama was slightly more popular. But Miley Cyrus and the Jonas brothers? Really girls? I thought you knew better than that. Of course, this survey was based in America. If it were British or Japanese tweens polled, I'm sure that the favorites would have been Queen Elizabeth II and Shigeru Miyamoto, respectively.